Washington and Oregon State, after splitting their season series, meet at 6 p.m. Wednesday when the Pac-12 tournament gets underway in Las Vegas. N0. 7 seed Washington (20-11, 10-8) will face No. 10 Oregon State (15-15, 7-11) Wednesday at 6 p.m. in the first round of the Pac-12 tournament at T-Mobile Arena in Las Vegas. The Huskies and Beavers split their two regular-season meetings, OSU winning 97-94 in double overtime in Corvallis Feb. 10 and Washington taking the rematch, 79-77, in Seattle Thursday. If the Huskies win, they will face No. 2 seed USC Thursday at 6 p.m. Washington upended the Trojans 88-81 in Los Angeles Dec. 29 in the only meeting between the schools this season. Seven of the 12 tournament seeds were determined Saturday, the final day of the Pac-12 regular season. 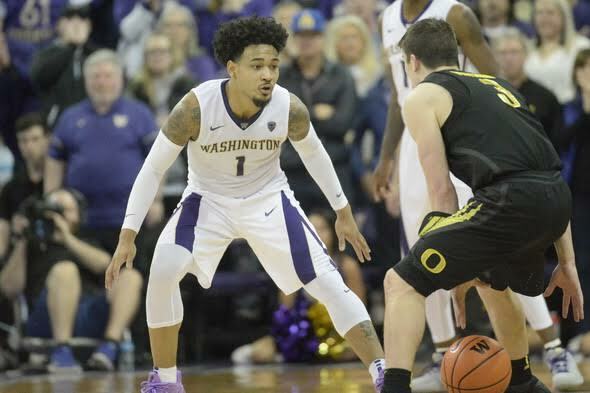 Washington finished with its first 20-win season since 2011-12, but dropped five of its final eight, including a 72-64 loss to Oregon Saturday, to fall to the No. 7 seed. Arizona (24-7, 14-4), a team Washington defeated 78-75 in Seattle Feb. 3, locked up its 16th conference title (13th outright) Saturday by beating California, securing the tournament’s No. 1 seed. The Wildcats, the tournament’s top seed for the eighth time in the event’s 21 stagings and the only conference school ranked in the Associated Press Top 25, drew a first-round bye and will play the Colorado-Arizona State winner Thursday. Pac-12 runner-up USC (21-10, 12-6) is the No. 2 seed after recording its most conference wins since 1995-97 (also 12-6). The No. 2 seed is the highest for the Trojans in program history. Stanford (17-14, 11-7), UCLA (20-10, 11-7) and Utah (19-10, 11-7) all finished with the same conference records. The Utes came earned the No. 3 seed and a first-round bye for the fourth consecutive season on the basis of a combined 2-1 record against the Cardinal (1-0) and Bruins (1-1). UCLA, which split the season series with Stanford, received the final bye as the No. 4 seed behind a victory over regular-season champion Arizona. The Cardinal (0-2 vs. Arizona) then slotted into the No. 5 spot. Washington State (12-18, 4-14) will be the tournament’s No. 11 seed. The Cougars, a 92-67 loser to Oregon State Saturday, will face Oregon Wednesday at 8:3o p.m. The teams split a pair this season, WSU losing 84-57 Feb. 11 in Eugene and winning 78-76 Thursday in Pullman. Washington seeks its first Pac-12 tournament title since 2011-12 and its third overall (also 2004-05 and 2008-09). The Huskises closed out a 9-22 season a year ago by losing to USC 78-73 in the first round. UW’s last win in the tournament came March 9, 2016, 91-68 over Stanford. The Pac-12 Networks will air eight games, including the first seven, starting Wednesday. Game times are 12 p.m., 2:30, 6 and 8:30. List of seeds: 1. Arizona (24-7, 14-4); 2. USC (21-10, 12-6); 3. Utah (19-10, 11-7); 4. UCLA (20-10, 11-7); 5. Stanford (17-14, 11-7); 6. Oregon (20-11, 10-8); 7. Washington (20-11, 10-8); 8. C0l0rad0 (16-14, 8-10); 9. Arizona State (20-10, 8-10); 10. Oregon State (15-15, 7-11; 11. Washington State (12-18, 4-14); 12. California (8-23, 2-16).